Yeah last year was busy with no time to post because [insert reasons here] but I have been cooking a lot and am ready to share some of my more successful dishes. 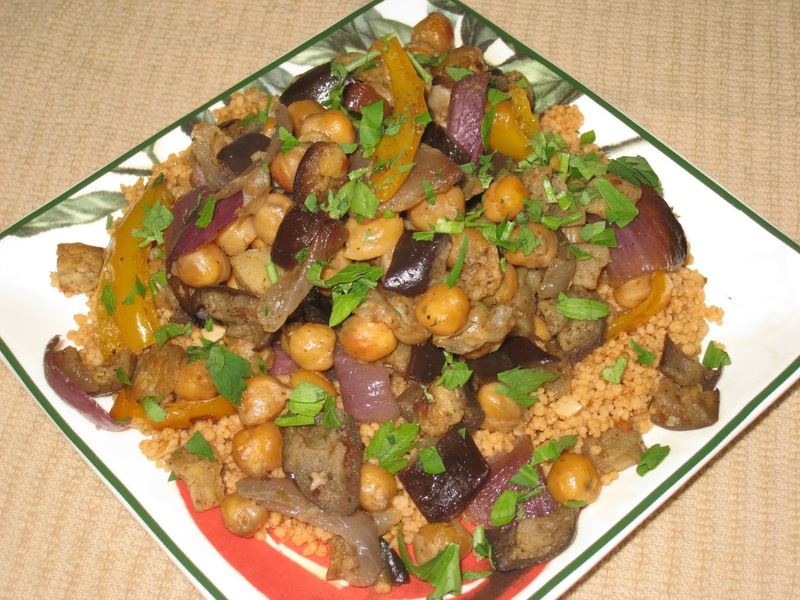 Like this Cumin Roasted Eggplant with Sweet Peppers and Chickpeas. This was surprisingly delicious, with a deep earthy flavor punctuated with the sweetness of the yellow pepper. Once I started eating it I could not stop. I adapted this from a recipe I found in Vegetarian Times. I have finally discovered why their recipes never worked for me. The original recipe called for 3/4 of a teaspoon of cumin, 3/4 of a teaspoon of coriander and a 1/4 of a teaspoon of cayenne pepper. That seemed like a low ratio of spice to vegetable so I increased the spices. I mentioned this to a co-worker when I was describing the recipe and she agreed that most of the recipes in Vegetarian Times don't use enough spice. I am thinking the recipes might be geared more towards people who are not used to using a lot of spices. I am also thinking that I will be increasing the amounts of spices in all Vegetarian Times recipes. I am thinking that will make them taste better to me. Your mileage may vary. I served the eggplant over tomato whole wheat couscous. To make that, I simply used tomato juice instead of water. It added a nice touch of acidity to the overall dish. Add a salad and you have a lovely dinner. It also travels well for weekday lunches. Combine the eggplant, onion, and bell pepper in a large bowl. Add the chickpeas, oil, garlic cumin, coriander, and aleppo pepper. Toss everything to coat then season to taste with salt and pepper. Spread the vegetable mixture evenly onto a parchment-lined baking sheet. Place the baking sheet on the middle rack of the oven and roast the mixture for 20 minutes, turning after the first ten minutes. Increase the oven to 500° F. and roast the vegetables for another 10 to 20 minutes, until tender. Serve with tomato whole wheat couscous.